How Are The Bots Doing? | Optima Group, Inc. In the past few years several new ETFs using artificial intelligence to guide their securities selection processes have come to market. While most of these funds are still quite young, we thought it might be of interest to see how they’ve performed particularly through the volatility at the close of last year. San Francisco-based EquBot has arguably the purest AI products with the broadest investment parameters and the most assets. EquBot employs proprietary algorithms and multiple artificial intelligence (AI) cognitive computing platforms to identify mispriced investments in the marketplace, optimize exposure, and then capitalize on the timing of those positions. EquBot’s first product was AI Powered Equity launched in October, 2017. The relative growth of this product is shown in the table below. 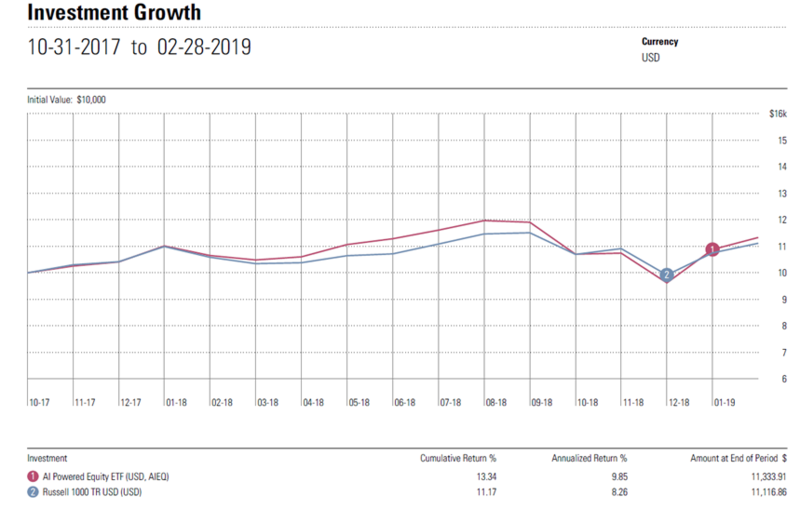 AI Powered Equity tracked the Russell 1000 Index relatively closely performing better in up markets but underperforming on the downside. A consistent and substantial relative advantage of AI in this fund still remains to be proven. EquBot also introduced an international fund in the middle of last year. Its results to date are shown in the chart below. 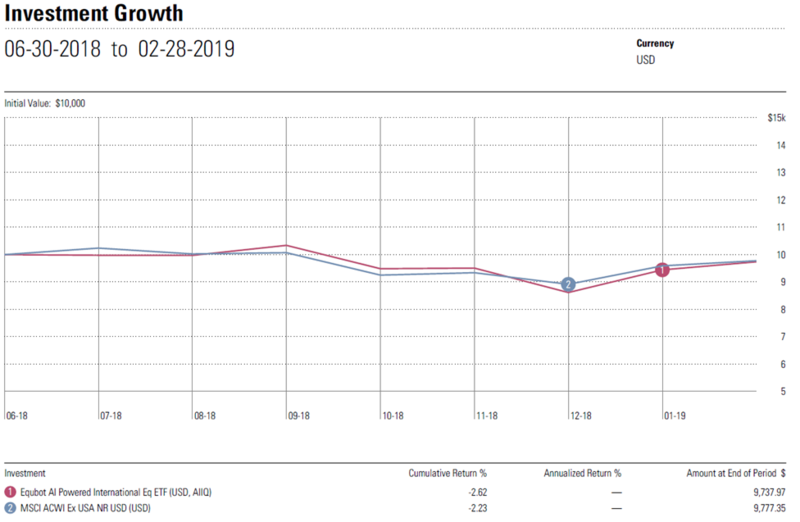 Tracking closely but slightly underperforming the index, this fund also cannot be considered clear proof of concept. Perhaps most important, neither EquBot fund was immune to the downside volatility late last year. Two other providers have introduced AI ETFs over the last two years. ○ iShares rolled out seven Evolved U.S. Sector ETFs. These funds build more accurate forward-looking indexes using text analysis guided by machine learning to identify words or phrases company’s use to describe themselves in public materials. The table below shows the returns of these products compared to best fit indexes assigned by Morningstar. Although results are mixed, in many cases, these funds have significantly outperformed their benchmarks. Overall, it is still too soon to tell how successful AI will be. These early results show significant promise in many cases, suggesting that AI is more a movement than a fad in investing.